No problem, I am glad you found it helpful. Also, I have received your messages and am looking into the rest for you. I will touch base soon! 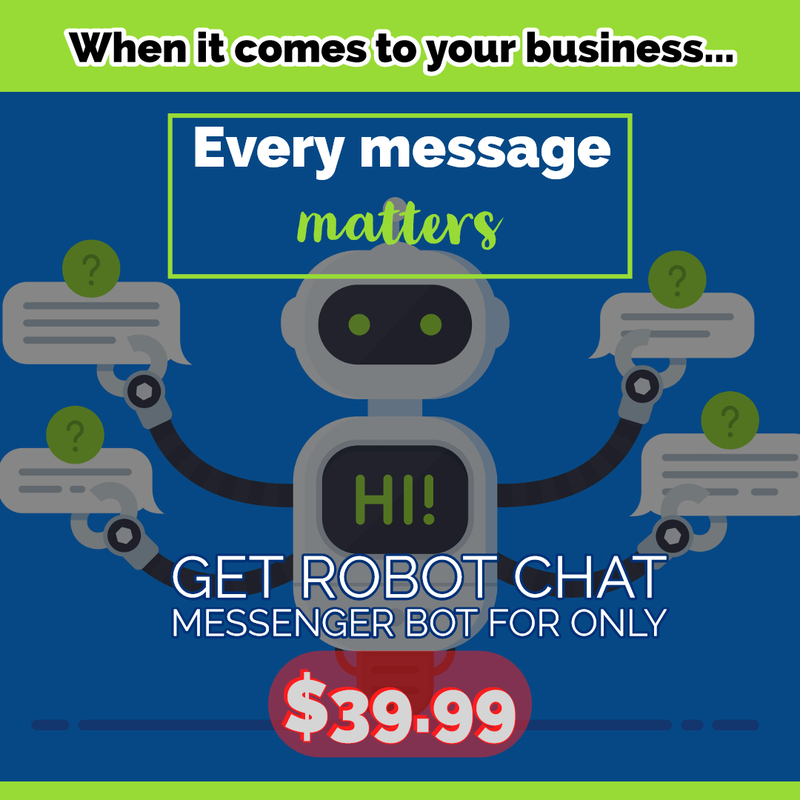 For anyone else still wondering about the discount, to get Robot Chat Messenger Bot for $39.99 instead of $149.99, place your order now at https://digitalmarketingwebdesign.com/robot-chat-messenger-bot/. Get Robot Chat Messenger Bot for $39.99 instead of $149.99 for a limited time without a promo code! Do I still need a code to get the special price or just click the link? Is it license for unlimited usage? Thank you for your interest in Robot Chat Messenger Bot. There is no promo code required, simply get started at https://digitalmarketingwebdesign.com/robot-chat-messenger-bot/. As I have seen, Manychat is a very versatile tool with lots of practical capabilities. Could we find at least THE SAME features on your bot? One more question...will the tool be constantly updated as more features are needed? Get it for $39.99 for a limited time! We offer discounts from time to time, check our last post in the thread or post and ask. Right now you can get Robot Chat Messenger Bot for $39.99! Does this sound like something you would like to promote and get paid for? Try Robot Chat Messenger Bot FREE for 14 days at https://digitalmarketingwebdesign.com/robot-chat-free-trial. New tutorials are available for pretty much every feature packed into Robot Chat Messenger Bot at https://digitalmarketingwebdesign.com/category/robot-chat-messenger-bot-tutorials/. + Many More Messenger Engagement Tools! Plus additional automations for Linkedin, Reddit, Twitter, Tumblr, and More! Robot Chat Messenger Bot started out as a Facebook and Facebook Messenger marketing automation tool, but has grown into so much more with your support! Pricing will increase as more features are continually added! Don't miss your chance to get Robot Chat Messenger Bot for a low, one-time cost! Take advantage of this discount, before this offer ends! Posting Automations for YouTube, Twitter, Tumblr, Pinterest, Blogger, and WordPress! Additional automations for Linkedin and More! There has never been a better time to switch to Robot Chat Messenger Bot for your social media automation needs! Robot Chat Messenger Bot is one of the few apps that is fully approved and compliant with the Facebook and Instagram app review process. Connect Any 3rd Party App Like Zapier or Your Own Custom Script! Additional automations for Medium and More! Yes, if you check the previous post, Zapier/webhook/any 3rd party custom script was just added. Tutorials are available for pretty much every feature packed into Robot Chat Messenger Bot. Robot Chat Messenger Bot is the last social media manager tool you will need! Robot Chat Messenger Bot is effortless social media marketing. Use Robot Chat Messenger Bot to run and mange your social media 24/7! Never before have so many social media automation features been available to the public, take advantage of automation and streamline your workflows! This deal allows up to 1 account import. One account can import an unlimited number of Facebook pages managed by the account. One example of spamming is sending repeated "flash sale" or promotional campaigns to your audiences or continuing to message individuals who have opted out in messenger. You can use Robot Chat Messenger Bot to auto respond to comments on both Instagram and Facebook posts. You can also moderate user comments on Facebook and Instagram, you are able to hide them (based on filters) and keep your post engagements! You can also respond to them as well. You can also use it for Instagram to respond to @ comments, other user comments, and business discovery. You are able to search and track hashtags as well for Instagram. Some of the best features include the ability to post from a single campaign and have it go to multiple social networks. Just the time saved from uploading a video to Facebook, YouTube, and other social networks from within 1 campaign can be a game changer, not to mention the ton of other social media automation features built in. You literally can create and schedule, or post a post onto multiple social networks in less than 10 clicks. On top of that, we have just barely got into the features. There are a multitude of other features and a free trial is available for 14 days for you to try it out for yourself! Our pre-launch special offer will not last long!